The beginning of each new month marks the time to reflect on what’s been happening In My Kitchen. 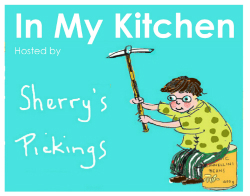 It’s the time I link up with the lovely Sherry from Sherry’s Pickings to join the worldwide “In My Kitchen” forum of food bloggers. Click on Sherry’s link below to see what’s happening elsewhere. It’s hot and humid in Brisbane over summer so if I can avoid using the oven, I do. My sourdough starter still needs to be fed and used so we’ve been eating a lot of sourdough flatbread that’s simply cooked in a hot dry pan. I began with the recipe from “Artisan Sourdough Made Simple” by Emilie Raffa, but each incarnation has had a slight adjustment until I have my own personal flatbread recipe which I’ll share next week. 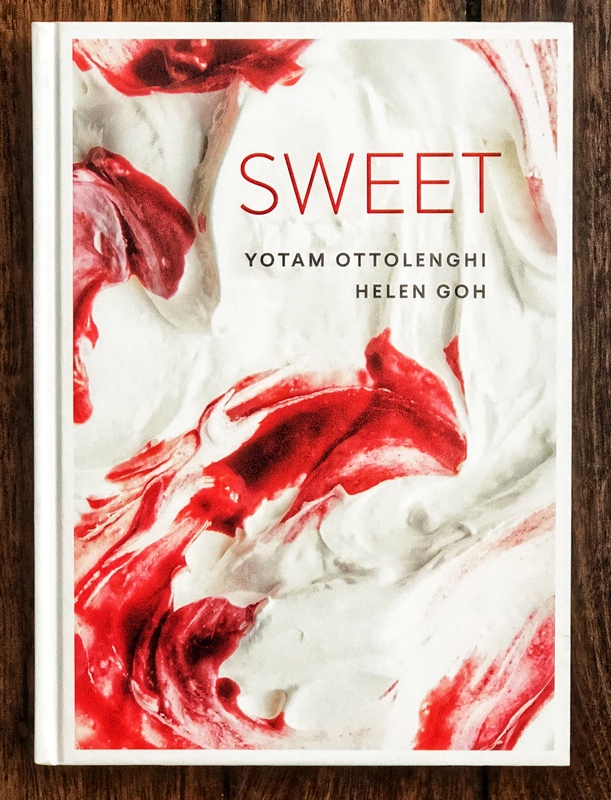 In My Kitchen is a new cookbook “Sweet” by Ottolenghi & Goh. This book has me drooling. I can normally pass dessert by, but based on the number of pages I’ve bookmarked, that may well change. Our Christmas dessert was inspired by the Passionfruit Cheesecake. 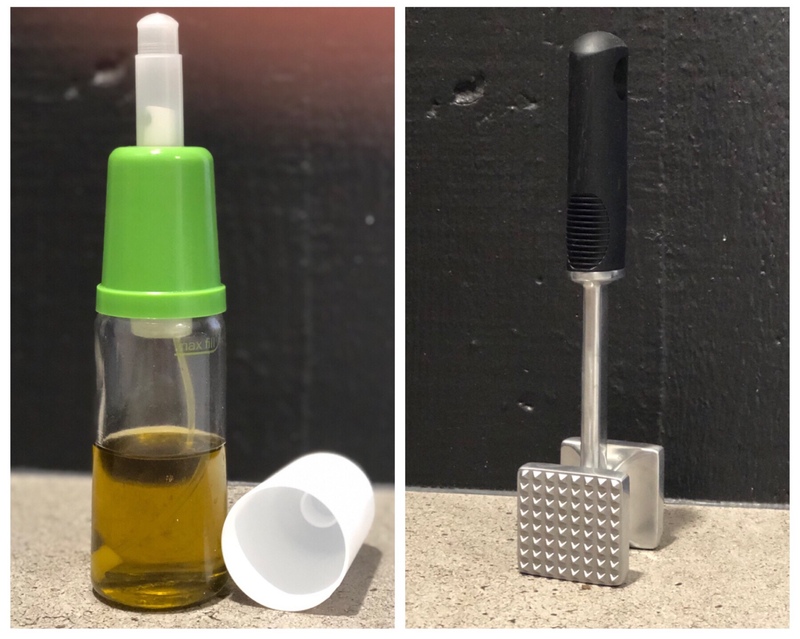 In My Kitchen I have a refillable oil spray with a pressure pump I bought in the Boxing Day sales. I have high hopes that I’ll never have to buy a can of olive oil spray from the supermarket again. I also bought a new meat mallet for pounding scallopine. In My Kitchen we have a complete set of new crockery to replace the scratched, chipped and depleted collection of miss matched odds and sods we’d been using for the passed 20+ years. Every meal feels special when your eating off plates designed by Ellen de Generes for Royal Doulton. 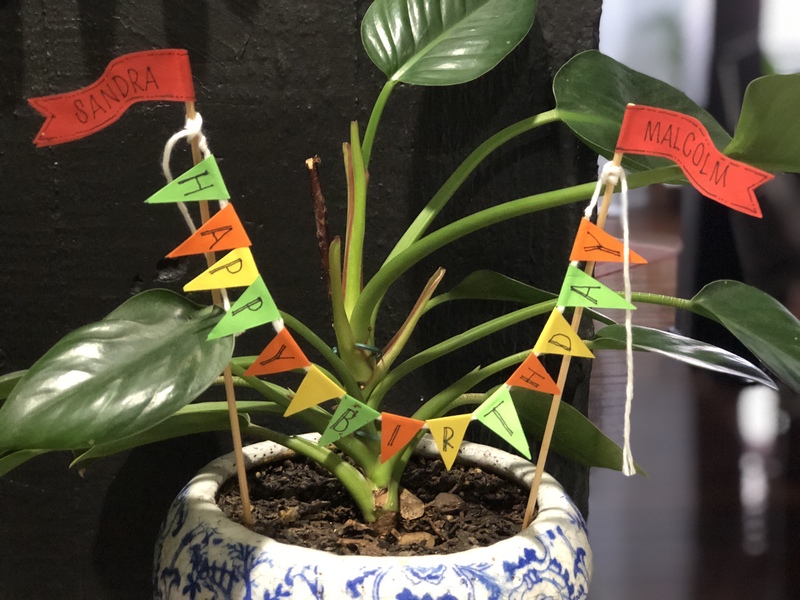 In My Kitchen is this wonderful little banner made with post it notes, satay sticks and string. An especially creative friend made it as a cake decoration when Mr G and I celebrated our birthdays recently. It’s now a priceless item of kitchen decor. Love those dishes! Didn’t know Ellen was designing/marketing those. Happy Birthday (a bit belated), Sandra and Mr. G! That banner is clever and colorful, and so is your idea to “re-purpose” it as kitchen decor. I haven’t tried an oil sprayer yet, but it sounds like a good idea. (I use one for my balsamic vinegar to “mist” salads… why not mist the oil?) Beautiful cookbook and dishes! Your flaky flat bread looks wonderful, too. Lovely new crockery. Nice to have a change. I am slowly moving on from white. Must look out for an oil spray- great idea, and better than adding more recycled products to the collection that now has trouble getting to China. Love the new crockery. Enjoy it! Fun post. I love your dishes! Sweet looks like a wonderful book. I just don’t bake enough to warrant buying it! I love your new crockery! Who knew about Ellen? I am eagerly awaiting that flatbread recipe. Love the new crockery. I was acquiring bits and pieces of new kitchen dishes, but with a more conventional style. These Royal Doulton, however, are really lovely. I can see how eating meals off of them are special. Happy belated birthday! Thanks Debi. RD are making everyday crockery at a very reasonable price, hard to go past. Flatbread post will be ready on time.. Awesome that you replaced an old “set” of dishes with matching new ones! That’s hard to do. The oil spray pumps are great, but I’ve found you have to keep it somewhere cool and dark or the oil gets rancid really quickly in our heat. I love your new crockery, it’s hard to go past blue and white for plate appeal! I’m always mindful of the climate with oils stored on the bench, so far so good for me. This entry was posted on February 1, 2018 by ladyredspecs in Cooking, Food, In My Kitchen and tagged IMK, in my kitchen.